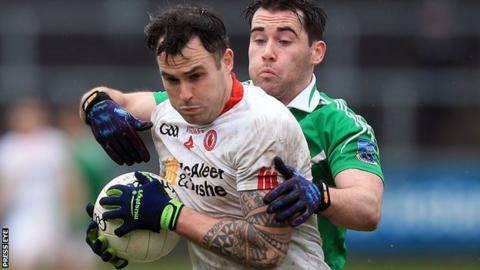 Tyrone look set to be without key defenders Cathal McCarron and Justin McMahon for their Ulster SFC opener against Derry at Celtic Park on 28 May. McCarron picked up a hamstring injury in training, while McMahon is struggling with a quad injury which has been slow to respond to treatment. Both are rated extremely doubtful for the first round tie, a repeat of last year's quarter-final, which Tyrone won. Conor Meyler has recovered from a hamstring injury and is set to start. McMahon's injury has kept him out of his last five club games and he is unlikely to feature as the Red Hands begin the defence of their provincial title against the Oak Leafers. "Cathal McCarron has picked up a hamstring injury which is concerning, because it only happened about a week ago," said manager Mickey Harte. "He has had a good couple of years for us and has a lot of ability in that sector of the field. "Justin has picked up a lot of niggly injuries throughout his career. He has quad injury at the minute and has had it for four or five weeks. "He's so versatile and so capable, and it's unfortunate, but we still have a lot of good players in the squad, a lot of versatile players."